The following is a list of the major league baseball players who played the most games without ever playing in a World Series. All these players had long careers, many spanning over 20 years, and a number of these players are in the Baseball Hall of Fame in Cooperstown. The list includes many players who won batting and home run titles and seven of these players hit over 400 home runs, while five hit over 500 and two hit over 600 home runs in their careers. All of these players were great players and All-Stars, but not one of them could lead their teams to the World Series. Steroids and performance enhancing drugs helped Rafael Palmeiro compile some great stats in his career, including 569 home runs, but they couldn't help him get to the World Series. 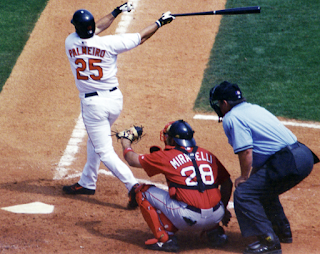 Palmeiro is the all-time leader in most baseball games played without playing in the World Series with 2,831 games spread out over a 20 year career. Seems fitting somehow. Ken Griffey Jr retired in 2010 after a 22 year major league career in which he hit 630 home runs, which is the 6th highest total of all-time. Ken Griffey made the postseason three times, but his teams never advanced to the World Series. Ichiro Suzuki now has 3,080 hits and he's played in 2,636 major league baseball games over 18 seasons but he's never played in the World Series. Andre Dawson was elected to the baseball Hall of Fame in Cooperstown, New York in 2010 after a long wait. He never made it to the Fall Classic as a player in his 21 year big league career. Mr. Cub Ernie Banks played 19 years and never made the World Series. Banks is usually listed as a SS but he actually played 134 more games as a 1B than he did at SS in his career. Julio Franco played major league baseball until he was 48 years old over 23 seasons but still never made it the World Series. Billy Williams is another Chicago Cub Hall of Fame player who never made it to the World Series despite playing for 18 years. Rod Carew won seven batting titles, played for 19 seasons and is in the Hall of Fame but never made it to the Fall Classic as a player. Luke Appling was the Chicago White Sox SS for 20 seasons and is in the Hall of Fame despite never playing in the postseason. After appearing in 70 games in 2014 for the New York Mets, Bobby Abreu now makes this list. I don't think he will get into the Hall of Fame, but Bobby Abreu has scored 1,453 runs, has 1,363 RBIs and 400 stolen bases in his career. Sammy Sosa is 12th on the list. Sosa was twice caught and suspended for cheating by baseball, once for a corked bat and once for steroids. Despite hitting the 7th most home runs of all-time at 609, Sammy Sosa will likely never make the baseball Hall of Fame due to his cheating ways. Frank Thomas has 521 career home runs and will make the Hall of Fame when he is eligible but he never played in the World Series. In 2005, his team made it to and won the Fall Classic but Thomas was injured and did not play. He's 15th on the list. Ron Santo is often said to be the best baseball player who is eligible and not tainted who is not in the Baseball Hall of Fame. Santo played 15 years for the Cubs while a diabetic and never even made the playoffs. Santo is 19th on the list of players with most games played without playing in the World Series. Joe Torre played 18 seasons as a major league baseball player and never even made the playoffs. He erased all that as a manager, though, winning four World Series as the manager of the New York Yankees, including 3 in a row from 1998-2000. Joe Torre was inducted into the Hall of Fame in 2014 as a manager. People will always debate whether the Yankees won because of Torre or despite him. Since he left the Yankees won another World Series with Joe Girardi as manager in 2009.